One of the world’s largest oil spill catastrophes is unfolding right now — in Nigeria. For decades, thousands of spills across the fragile Niger Delta have destroyed the livelihoods of fishermen and farmers, fouled water sources and have polluted the ground and air. The Nigerian government estimates there were over 7,000 spills, large and small, between 1970 and 2000, according to the BBC. That is approximately 300 spills a year, and some spills have been leaking for years. Vast swathes of the Delta are covered with tar and stagnant lakes of crude. By some estimates, over 13 million barrels of oil have spilled into the Delta. That’s the equivalent of one Exxon Valdez spill every year for 40 years, according to The Independent. 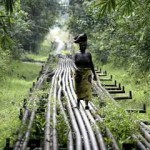 Nigeria is the fifth largest exporter of oil to the United States and the largest producer in Africa. The government has threatened Exxon Mobil with sanctions if the corporation fails to manage spills properly, according to Agence France-Presse. It hasn’t been determined what the sanctions would entail. Previous attempts by Nigerians to attain damages against oil companies have been mostly unsuccessful. Idris Musa, head of Nigeria’s oil spill response agency, said an additional 2,405 spills by all major oil companies in the region have occurred since 2006. 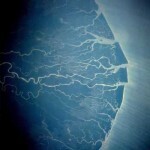 The Delta is densely populated with about 31 million people. Thousands of miles of above-ground pipelines snake throughout the Delta, passing through cities, towns and villages as well as delicate wetlands. There are several reasons for the huge number of spills, including a crumbling, aging oil infrastructure and outright sabotage by thieves and warring rebel groups. Corroding pipes, according to Bloomberg Businessweek, caused a spill in May 2010 that leaked about 232 barrels of crude. 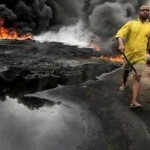 Human rights groups have attacked the response of large oil-extracting multinationals in the Delta. Last year, a report accused Shell of covering up its oil spills by blaming them on “routine militant attacks.” The report instead placed blame on Shell’s crumbling system of rigs, taps and pipelines. Shell defended itself by saying 85 percent of the recent spills were caused by sabotage. Many Nigerians put out of work by the spills collect polluted oil for sale on the black market. The illegal practice, known as “bunkering,” can bring in about $67 per day. The average Nigerian income is about $2 per day, according to Reuters. Nigeria has generated about $600 billion in oil revenue since extraction began in 1958. Government corruption is largely blamed for oil revenue not increasing the standards of living for average Nigerians. It is sad to note the trend of large western multinationals having double standards of safety norms i.e., different standards for the poorer and less developed nations..taking advantage of the relatively lesser awareness of rights by people in those countries and the week policies/ politics of such nation. ExxonMobil, Shell story seems similar in that respect to that of the Bhopal gas leak in that sense. It seems we now have the potential to learn world events as this in real time. We the people that are disheartened by this oil mess should unite collectively by telepathy and stop this insane nonscense of allowing men and women to capialaize on what this earth was given in origin to support life, we either end it or end our species. Ofcourse, the small people do not count, and that is why this environment disaster has not been reported truthfully on the main news anywhere in any country. Money first and then people last. It’s so sad that we are destroying the environment that keeps us. What about solar energy, wind energy, etc sources that do not destroy the environment? How many pple have perished as a result? I hate the American Hypocrisy of it all. They are up in arms when the oil lands on their shores wich is bad dont get me wrong, but they are blind when it comes to the rest of the world and the damage their thirst for oil has done to other nations. This is disgusting, American officials don’t care how people live as long as they have oil. Human life is worth any amount of oil. I hope the US senators see this! This must not go unnoticed, the Nigerians have a right to live a good life just as much as us. As the constitution says “All men ARE created equal.” The US government should fallow its own rules. Have a look at googles new video policy. Atrocities like this at the moment thank God are quickly reported but I’m afraid the freedom of the net is under threat.The American government want the anonymity of the net addressed,watch for any new legislation and resist it however you can.Obama has some in the pipeline as we speak.The oblivious majority need to wake up and educate themselves of the reality of the times we live in. Nigeria is the fifth largest exporter of oil to the United States and the largest producer in Africa, so we need to do something really fast about this issue.